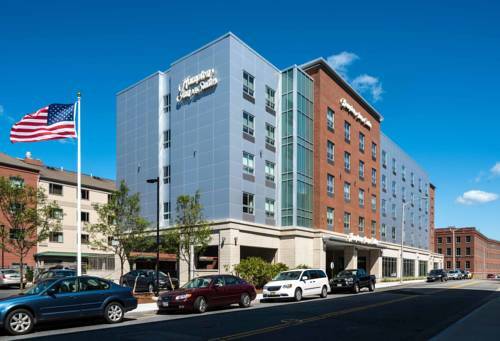 Welcome to Hampton Inn - Suites Worcester. Whether you*re here for work or a weekend visit you*ll find a great location and your favorite amenities at our downtown Worcester hotel. Walk to corporate offices restaurants colleges shops and historic sites or use our convenient 24-hour shuttle service. Enjoy the view from 5 floors up the hotel overlooks the Worcester Art Museum DCU Center and the Worcester Polytechnic Institute. Each guest room has modern comforts like a 37-inch HDTV microwave mini-refrigerator and coffeemaker. Use free WiFi to check email and rest on the clean and fresh Hampton bed. Choose a suite for more space a wet bar and a seating area with sofa sleeper. Accessible rooms are also available. Join us each morning for Hampton*s free hot breakfast including fresh-baked waffles eggs bacon oatmeal and fruit. Our 24-hour Treats Shop has snacks drinks and travel items and there*s always tea and hot coffee in the lobby. Feel like dinner out. Our staff is happy to suggest a place downtown. Unwind after work in the heated indoor saltwater pool or work out in the free fitness center. Our Worcester MA hotel also has a 651 sq. ft. meeting space for up to 40 guests plus a free 24-hour business center. Reservations must be cancelled 24 hours prior to arrival to avoid a penalty. Over 20 feet tall and 3,000 pounds. Still impressive, even if other chairs are larger.